Well since its over an hour now and nobody has, may I have the honour? "European Parliament threatens to veto Theresa May’s new Brexit plan over Irish border"
The intervention means there is likely to be further trouble ahead on the Ireland issue – with the risk that the whole deal could be sunk over it. UK officials in Brussels say they have now have no plans to bring forward new proposals on the border, having proposed a solution to it last month. And were it not for the PTO, I probably wouldn't be - so thanks (I've just woken up). I've just watched Donald Trump's sales pitch for the US arms industry. Cracking stuff. We've go the best guns and the biggest guns and the best weapons and the biggest weapons and the best and the biggest EQUIPMENT you have ever seen! Apparently, Donald Trump can only visit people who have very big back gardens (big enough for a helicopter to land) since he's having to go everywhere in a helicopter to avoid protesters. Was in that London today and saw two big helicopters. Guess it must have been the Donald on his visit to see his fans in the United Kingdom of Great Brexit. They did indeed look like this. Has she been bitten by a mad dog , a bat, or aaaargh Liam Fox ? Jared O'Mara resigns Labour whip. An exclusive for The Sun? 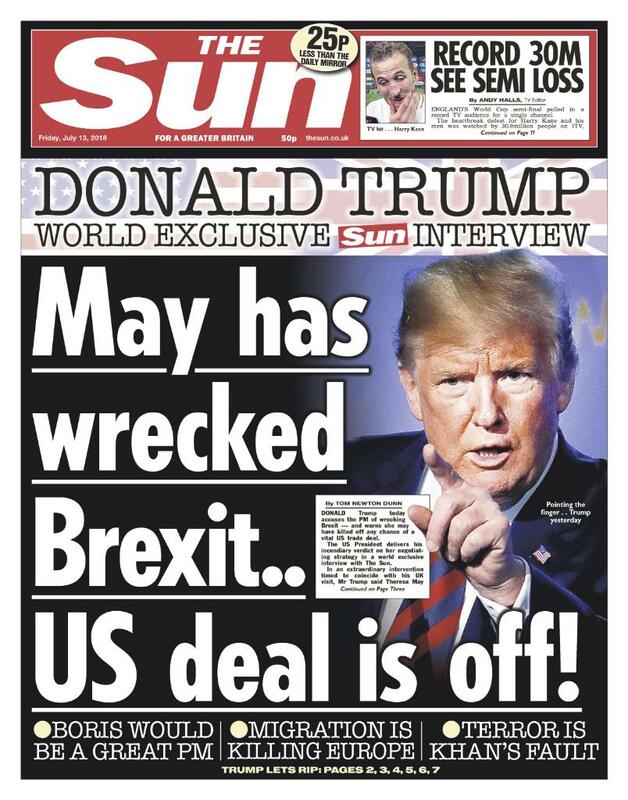 WORLD EXCL: Donald Trump warns Theresa May her soft Brexit blueprint will "kill" any future trade deal with the US. Full @POTUS interview with @TheSun from 11pm. Tks for the link, smart work ! Donald Trump just made me buy a KitKat. It wasn't my fault (honest). Great photo on the home page of the G: May pouting prettily at a pleased-with-himself-looking Trump while May's hubbie looks mildly put out. Blimey, I agree with DFH! The British Prime Minister has outlined her policy on Brexit. The US president has outlined his policy on Brexit. Tonight, the Brexiteers are telling the British people they must side with the US president. In the name of sovereignty. I know. Let's cut all ties with the EU in order to please Donald Trump - so that we can look surprised when he offers us a trade deal on his terms and all that that would entail. I can't see any downside to that at all. Is this an exemplar of the clock that is right just once per day? Being mainly nocturnal (which could be just a phase) isn't really working out for me here, is it? Maybe more like a broken calendar clock? "With criticism of May's Brexit, Trump detonates a diplomatic grenade"
Failing that, as Trump goes on to take tea with the Queen, the prime minister could always join the demonstrations on the streets of London. It seems she has nothing to lose.